Notes: Two other examples of this type of Baker gun are recorded. The first (now in an English private collection) is numbered 1276 and was sold at Christie’s, King Street, on 29 March 1995, lot 191. The second (serial number 1504) is in the collection of H. M. the Queen at Winsor Castle and also bears the Prince of Wales’s feathers in gold – it is recorded as having been purchased for the Royal Collection from the maker in 1809. The Prince of Wales’s collection of new and antique arms, displayed originally at Carlton House, forms (together with his father’s collection) the nucleus of the present-day collection at Windsor. George Prince of Wales (Prince Regent in 1811 and King George IV in 1820) was an enthusiastic patron of the leading London gunmakers of the late 18th and early 19th centuries, of which Ezekial Baker was the most influential. Baker spent much time in attendance on the Prince Regent and sold him numerous firearms, mostly now at Windsor. In later editions of Baker’s book Remarks on Rifle Guns, the author printed targets shot by the Prince at Brighton. The donor’s initials on the escutcheon presumably stand for ‘Georgius Princeps’. 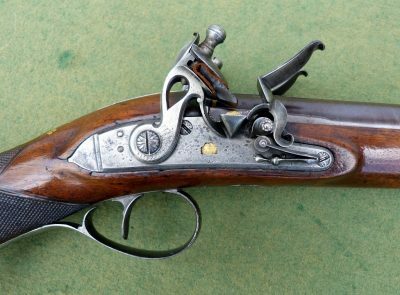 The recipient, ‘My Friend Bob’, may have been Lord Robert Seymour (1748-1831), son of Francis Seymour, 1st Marquess of Hertford, who is known to have received a Baker carbine as a gift from the Prince of Wales in 1809.